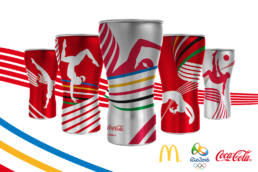 McDonalds in partnership with Coca-Cola launched the exclusive Olympics Tumblers for Rio 2016. Created and developed by PPi Worldwide, the tumblers are made of aluminum with a capacity of 600ml. There are 5 different designs inspired in some of the iconic olympic sports. The promotion took place in 9 countries including Brazil, Israel and Chile.